Most of us are not keen on sailing, mooring or paying for more boat than we need, or than we can handle. Therefore, the shift to smaller, couple-sized cats is a welcome one as more builders focus on this segment of the market. 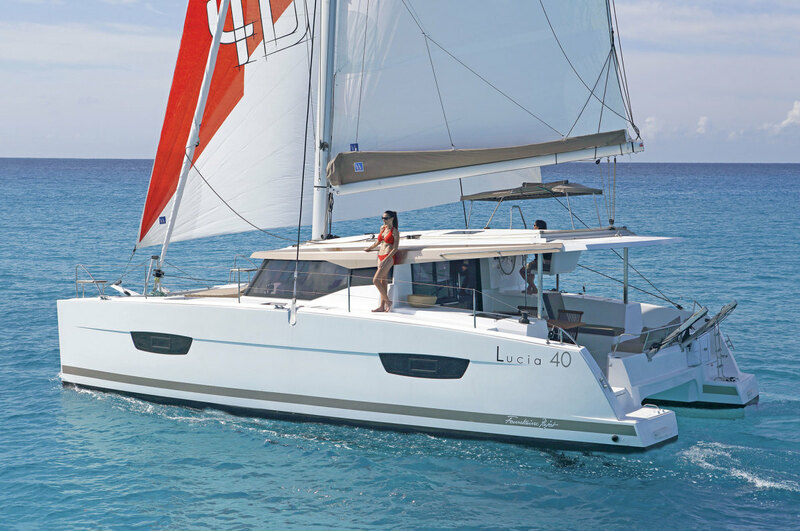 The newest addition is the Fountaine Pajot Lucia 40, which sews up the amenities found on her bigger sisters into a neat and tidy package that will fit many slips and budgets. 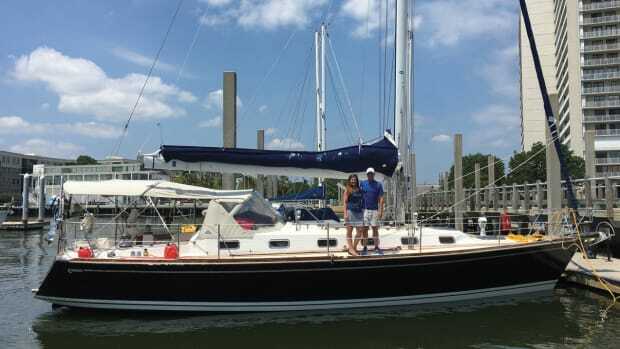 It’s probably no accident that the French boat builder launched this 40-footer for its 40th anniversary—a nice birthday present to itself as well as to sailors seeking a manageable cruising platform with two hulls. 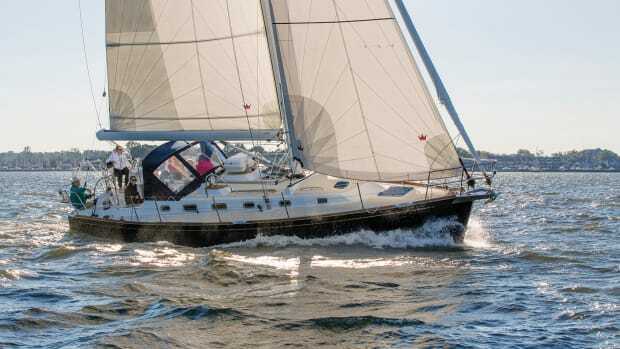 The design team of Berret-Racoupeau was tasked with bringing big-boat allure to a smaller footprint, and the result is a sleek cruiser that has plenty of beam and deck space without looking boxy or awkwardly tall. 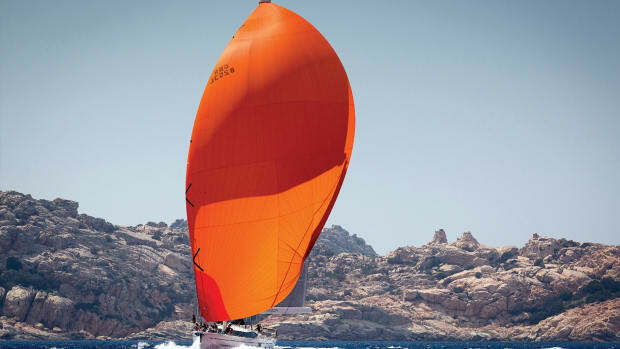 The hulls have a fine entry for better performance, the fixed keels eliminate the need for daggerboards and the coachroof angles down as it swoops forward, adding the perception of movement or speed. The Lucia 40 is actually bigger than the Lipari 41 she replaces, featuring a more spacious cockpit, more interior volume and larger windows all around. Construction is comprised of a PVC foam-core sandwich with vacuum-laminated outer skins. The deck and cabinhouse are fabricated via resin transfer moulding (RTM) with both sides sprayed with gelcoat for a finished look from every angle. Boarding via the aft transom platforms is made easier with well-placed handholds. From here, it’s only one step up to the cockpit, which as mentioned, is quite spacious. In fact, it is almost the size of the cockpit of the Helia 44—the next size up in the Fountaine Pajot line. 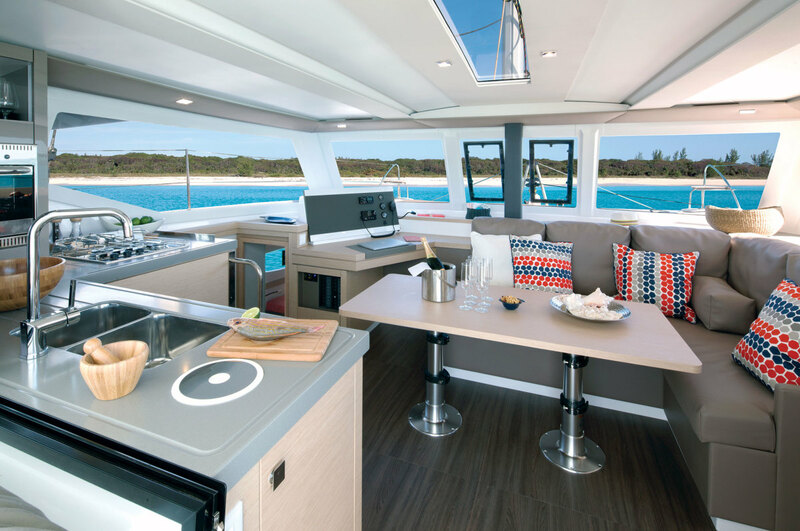 The portside L-shaped dinette can accommodate up to eight, and there is additional seating along the transom and on the starboard-side lounge. The entire cockpit is protected by a composite bimini, which also serves as an anchor point for the large mainsheet traveler. The helm pod to starboard is elevated and molded into the bimini, with access from the deck as well as via a set of steps from the cockpit. 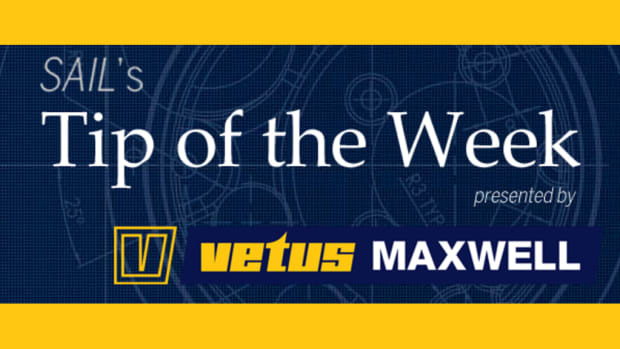 There are a number of nice features here: the seat accommodates the captain and a companion, with ample room for two to work (one to steer and one to manage the three Lewmar winches and Antal rope clutches). Yet another set of steps leads up to the coachroof where the boom is low enough that it’s easy to reach over and tuck away the mainsail at the end of the day. 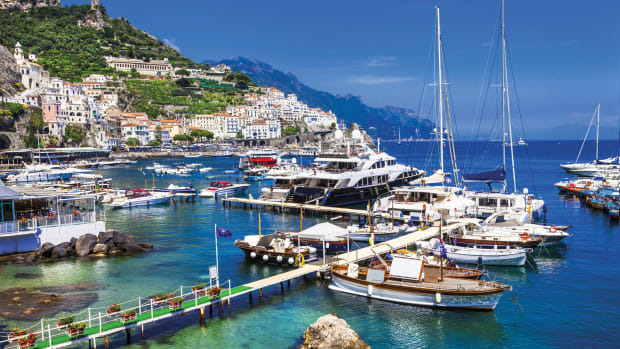 In addition, the Raymarine multifunction display is conveniently located, and there is a small sheet bin built in to keep the spaghetti tidy. That said, while visibility is good forward to starboard, it is a bit more of a challenge toward the port forward corner and nonexistent to either of the transoms unless the helmsman ducks and looks under the bimini. Additionally, the switches for the electric winches are awkwardly tucked in by the engine throttle handles and not convenient for anyone working the winches outboard. The good news is that the helm is open to the side, so it’s easy to step out onto the deck when docking starboard-to and handing off lines. Forward, there is a large optional sun pad “lounge” that spans the front of the cabinhouse. It’s a nice place to relax if you don’t like lying in the trampoline: although that too has been redesigned as the mesh now goes all the way to the edges without the usual gaps, and there is also no middle strut to get in the way. Below the sun pad is a pair of lockers housing the water tank, the Quick vertical windlass and some large stowage spaces. The coachroof is high enough that another step would be useful forward, so you could hop up near the mast rather than having to go aft to the helm steps. The Lucia 40 is available in two basic versions, a three-cabin Maestro, and a four-cabin Quatuor, but with four different layouts (with three or four cabins and two to four heads). Our test boat featured the three-cabin Maestro version, in which the entire starboard hull is dedicated to a master suite that is nice and open. The walk-around island bed aft is low and easy to get into, and the small desk will hold odds and ends that don’t belong at the nav station. Fountaine Pajot did away with the sofa, which has never made sense to me anyway, and in its place added lockers that not only provide excellent stowage, but can accommodate an optional washer/dryer. As is the case with the FP Saba 50, the toilet is in its own compartment, which means the shower and sink can be used even if the head is occupied. The sink is oversized and nobody will complain about the generously proportioned shower although it is a bit odd that this area has no door to separate it from the rest of the cabin. On our test boat, the port hull had two cabins and two heads, neither of which had a shower stall. Perhaps a better solution to a non-charter boat would be two cabins on this side with a shared head that then has a separate shower compartment. The bow spaces have been shortened by moving the bulkheads forward, and this area is dedicated to stowage rather than shoehorning in another sleeping space. Shifting things forward is where the extra space in the cockpit actually came from. The saloon is surprisingly spacious for a boat of only 40ft. Glass doors open to reveal a cooking and socializing area on the same level as the cockpit. Six can sit at the L-shaped settee, which shares a seat with the dedicated nav station. I am a huge fan of nav stations, even in today’s world of all-electronic navigation, because there is more to running a boat than just pushing the buttons on a multifunction display. Vitrifrigo fridge drawers are located to starboard as is an L-shaped galley to port. The sink is by the window, which slides open for easy communication with the cockpit and helm. There are also a separate counter-height oven and a three-burner Eno stove. The countertop space and galley stowage are limited, but the soft-close drawers are plentiful—a nice touch. Although a skylight brings in plenty of natural light, there is no opening hatch above (or even by the stove) and I suspect the horizontal portlight will tend to heat up the interior without adding a breeze. The fact that the two forward-opening windows are protected by the extended coachroof, which in turn means they can remain open even in the case of a light rain, is a plus. Test day on Florida’s Biscayne Bay was one of those unfortunate, windless outings that never show a boat in its best light. However, we did manage to eke out 3.6 knots of boatspeed in 4.5 knots of wind at a 60 degree true wind angle—not bad when you think about it. We could have used a Code 0 for our downwind leg (1.7 knots of speed in 2.1 knots of wind at 120 degrees with the jib), but this was hull #2 of the design and on only its fourth sail ever, so the gennaker wasn’t there and neither was the (optional) bowsprit that it attaches to. 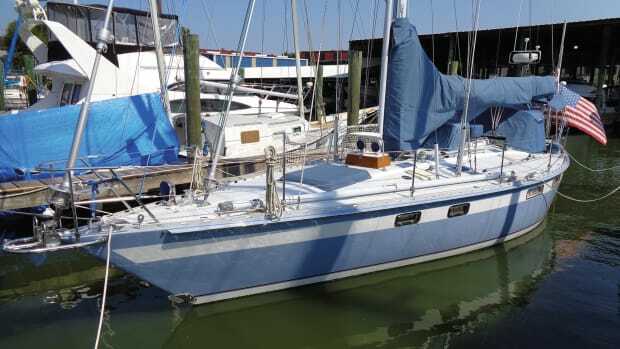 The good news is that with just over 1,000ft² of sail area between the genoa and the mainsail, I expect that this model, which comes in at under 20,000lb, will be light on its feet given 10 knots or more of breeze. Twin 20hp Volvo Penta diesels are standard and the engine rooms are quite spacious with good access to the machinery all around. There is a shelf to hold batteries and the port side can accommodate an optional Northern Light genset. Our test boat sported a pair of upgraded 30hp engines that maxed out at 3,000 rpm and 7.8 knots. A more economical speed was 6.7 knots at 2,400 rpm at which the boat’s 80 gallons of fuel will deliver the greatest range. 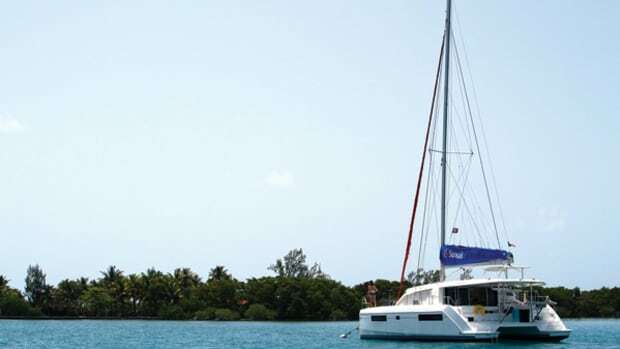 With at least three other major 40ft catamarans on the market, Fountaine Pajot is right to get in the game.  The Lucia 40 is a well-sized boat that will appeal to couples and families that want the versatility of a multihull without all the extra real estate and expense. She’ll make an excellent birthday gift for anyone.